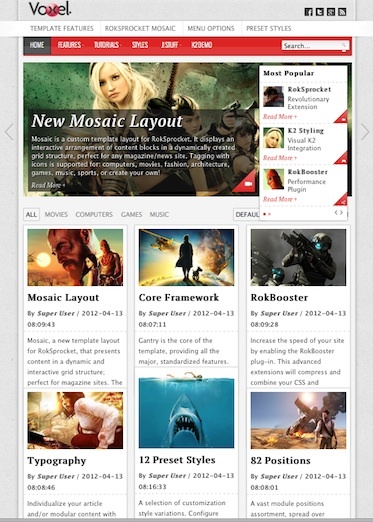 Create a magazine website with Joomla 2.5 Template Voxel. Voxel is a professional and elegant Joomla 2.5 Template that has a scrolling featured image, amazing menus, 82 module positions, ability to load all or more posts, categorize content, advanced filter to show/hide articles, display content in a dynamic and interactive grid structure; perfect for magazine sites. The grids auto-align, so it doesn’t matter if you have different sizes for images or text. Click here to see more detail about Voxel. RocketTheme is a premium Wordpress and Joomla 2.5 / Joomla 3.0 Template provider. I love RocketTheme because their themes look so professional and have tons of module positions. They provide template solutions to create Business websites, Magazine Websites Portfolio Websites and more.